In most patients with severe aortic stenosis, management is relatively straightforward. Prognosis is excellent even in patients with severe valve obstruction as long as they are asymptomatic. 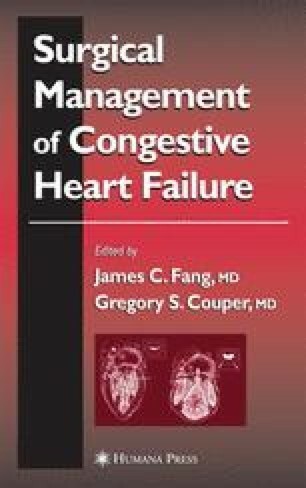 However, once the classic symptoms of angina, syncope, dyspnea, or other symptoms of congestive heart failure (CHF) develop, prognosis dramatically worsens (1,2). Because 75% of symptomatic patients will die within 3 years of the onset of the symptoms unless the aortic valve is replaced, the onset of symptoms is a compelling reason to perform aortic valve replacement. In many asymptomatic patients, left ventricular (LV) hypertrophy normalizes wall stress, and LV systolic function is normal. However, the increase in wall thickness necessary to compensate the increased pressure term of the Laplace equation (stress equals the pressure times the radius divided by twice the thickness) results in reduced LV compliance and diastolic dysfunction (3). Typically, diastolic dysfunction precedes systolic dysfunction; thus, when congestive symptoms do arise, systolic function is usually normal.